I’ll be speaking and roaming around The Tech Museum’s OpenMake:Flow event Saturday from 10am to 3pm. If you’re a maker, or want to be one, drop by and hang out with a bunch of makers and check out their creations, mine among them. As of this week I have officially kicked off Anthrolume 4.0. This time I’m changing the form factor somewhat – instead of using a jumpsuit, I’m using a huge trenchcoat. And instead of 250 LEDs, I’ll have over 1,000. My plan is to use the same computer belt I used for the Anthrolume 3.0 suit, but with different batteries. 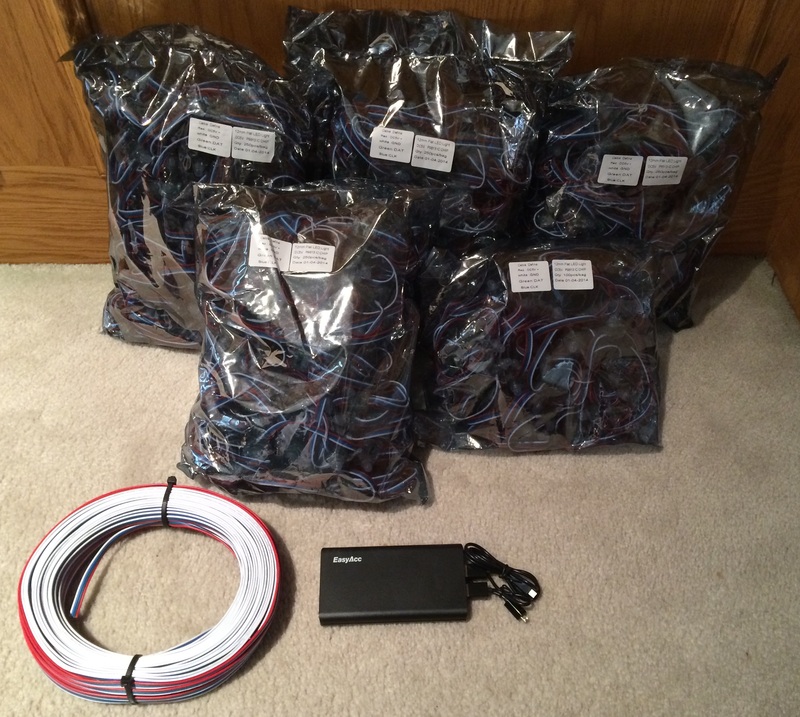 This time we made a big order of LEDs directly from a Chinese Supplier (thank you Rose!) and I just got my portion of our order today. Also shown below is a battery pack I bought for testing. It claims to be able to deliver 3.6A at 5V. I’m going to hook it up to 60 LEDs and see if it can really drive them to full brightness, which would be 3.6A. I doubt it, but using that test rig I’ll be able to see just how much power it really can deliver. My Animaker software is already designed to support any given suit I create. I just have to create a new coordinate map for the trench and re-render my animations. It’s that easy. I am planning one larger change to the software this time. Anthrolume 2.0 and 3.0 read their animations from an SD card. I did that in the logical way – by putting each animation in a file, and opening/closing files as needed. That worked fine, but it turns out to be pretty expensive to open files – 20ms expensive. That prevents me from doing something I wanted to do – change from one animation to another with frame-accuracy (meaning, within no more than 1/40th of a second). To achieve that in the next generation of the software I am going to put all the animations and their metadata all into a single big (~1GB) file. I will open that file exactly once, and just move around in it to switch animations. That will facilitate the frame-accurate animation changes that eluded me last year. I also have a better phone (a Moto G) this year to use for the Bluetooth remote control. My “Guest” mode addition last year was a huge hit, and I’m planning to expand those capabilities this year.